Amsterdam, NL – Non-motor symptoms are common in late stage Parkinson’s disease (PD) as the frequency and severity of most of these symptoms increase with advancing disease. Optimizing dopaminergic treatment in the most severe stages can affect non-motor symptoms and improve quality of life, report scientists in the Journal of Parkinson’s Disease. PD is generally considered a disease that affects movement, but it also involves a large number of non-motor symptoms, which previous research has shown to have a greater impact on health-related quality of life than motor symptoms. Common non-motor symptoms include cognitive impairment, mood-related symptoms such as depression, apathy, sleep/daytime sleepiness, fatigue, and autonomic dysfunction such as urinary urgency, incontinence, and erectile dysfunction. The frequency and severity of most of these symptoms increase with advancing disease. Previous research has shown that the frequency and severity of non-motor symptoms as a whole are the most important predictors of health-related quality of life in patients with PD. The goal of the present study was to find an optimal pharmacological treatment for patients with late stage PD. Investigators assessed the effect of dopaminergic therapy on non-motor symptoms in 30 patients. Participants were recruited from the southern region of Sweden through neurology departments and the municipality-based health care system. The patients were in “Hoehn and Yahr” stages IV and V; the Hoehn and Yahr scale is a commonly used system for classifying how the symptoms of PD progress. The dopaminergic effect on non-motor symptomatology was assessed using a Non-Motor Symptoms Scale (NMSS) in the “off” and the “on” state during a standardized L-dopa test and assessing non-motor symptoms in parallel with motor function. Motor symptoms fluctuate between an “on” state, during which the patient experiences a positive response to medication, and an “off” state, during which the patient experiences a re-emergence of the Parkinson symptoms suppressed during the “on” state. The study found that non-motor symptoms were common and many of the symptoms occurred in more than 80% of the individuals. 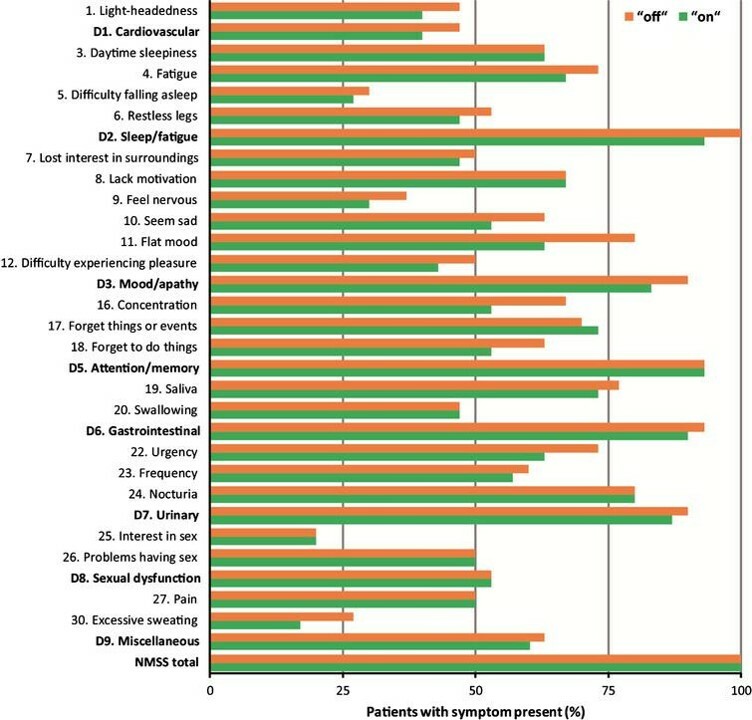 The highest scores (frequency x severity) were seen within the NMSS domains 3: mood/apathy and 7: urinary in both the “off” and the “on” states. The differences in the NMSS score between the “off” and the “on” state were larger in general for motor responders than for motor non-responders. The investigators concluded that there is often an L-dopa effect on both motor and non-motor symptoms even in the most severely ill PD patients, and that even if there is not a significant motor response, there was often a non-motor effect, particularly on mood or depressive symptoms. They emphasize the importance of optimizing L-dopa treatment in the late stage of the disease to give patients the best possible quality of life. “We encourage colleagues who treat PD to pay attention so that the treatment is optimized throughout the disease progression and into the most severe disease stages,” commented Dr. Odin. “The knowledge that sufficient dopaminergic treatment may have important effects on both motor and non-motor symptoms in severe PD patients can hopefully help treating physicians improve quality of life for their patients with late stage PD. Full study: “Dopaminergic effect on non-motor symptoms in late stage Parkinson’s disease,” by Kristina Rosqvist, Per Odin, Peter Hagell, Susanne Iwarsson, Maria H. Nilsson, and Alexander Storch (DOI: 10.3233/JPD-181380), published in the Journal of Parkinson’s Disease, Volume 8, Issue 3 (August 2018) by IOS Press. The article is available at: https://content.iospress.com/articles/journal-of-parkinsons-disease/jpd181380. This was a Swedish subproject within the JPND funded Care for Late Stage Parkinsonism (CLaSP) research program (the Swedish Research Council funded the Swedish part). The project was also supported by: MultiPark, the strategic research area for neuroscience at Lund University; the Swedish Parkinson Foundation; the Swedish Parkinson Academy and the Faculty of Medicine at Lund University. For additional information or full text of the study, contact Diana Murray, IOS Press (+1 718 640-5678; d.murray@iospress.com). Journalists wishing to interview the study’s authors should contact Kristina Rosqvist (kristina.rosqvist@med.lu.se) or Per Odin (+49 175 2048124; per.odin@med.lu.se) at Lund University. IOS Press serves the information needs of scientific and medical communities worldwide. See what's new and browse our books and journals to learn more.